SHARP, JAMES, a prelate whose name is connected with the establishment of Episcopacy in Scotland, was born in the castle of Banff, May 4, 1613. He was the son of William Sharp Sheriff-clerk of Banffshire, whose father, David Sharp, had been a merchant in Aberdeen. His mother was Isobel Lesly, daughter of Lesly of Kininvy, a near relative of the earl of Rothes. Being early destined for the ministry, he was placed at Marischal college, Aberdeen, on quitting which he proceeded into England, and visited the universities of Oxford and Cambridge. On the recommendation of the celebrated Alexander Henderson, he subsequently obtained the professorship of philosophy in the university of St. Andrews. In 1648, at the request of Mr. James Bruce, minister of Kingsbarns, he was presented by the earl of Crawford to the church and parish of Crail, on which he resigned his chair. Remarkable in his early career for his attachment to Presbyterianism, he enjoyed the full confidence, and took part in all the councils, of the leaders of the church of Scotland, and in 1650 was elected one of the ministers of Edinburgh, but the troubles of the time consequent on Cromwell’s invasion of Scotland prevented his acceptance of the call. In August 1651 he and a number of other ministers, with some of the nobility, were surprised by a party of the English at Alyth, in Angus, at the time General Monk was besieging Dundee, and being put on board a ship at Broughty Ferry, were carried prisoners to London. He seems to have obtained the favour of Cromwell, who set him at liberty, while the rest were retained for some time in confinement. 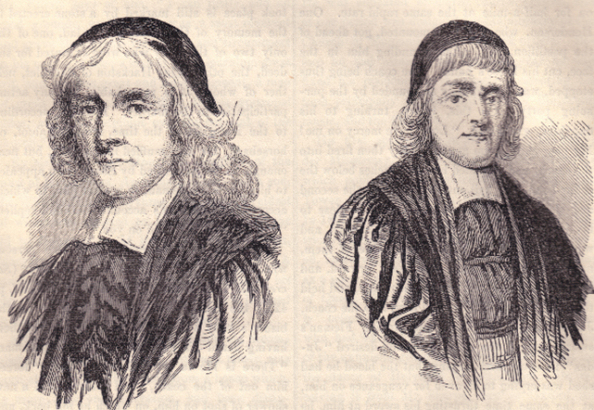 When the division took place among the Presbyterians of Resolutioners and Protesters, Sharp joined the former, and in 1657 was sent by his party to London to plead their cause with Cromwell, in opposition to Messrs, James Guthrie, Patrick Gillespie, and the other commissioners from the Protesters. On this occasion he so much distinguished himself by his address that Cromwell remarked to the bystanders, “That gentleman, after the Scotch way, should be called Sharp of that ilk.” In January 1660, on the prospect of the Restoration, he was again, with five ministers of Edinburgh, dispatched to London by the leading ministers on the side of the Resolutioners, to communicate the views of their party to Monk. He remained in London till May 4, when he was sent by Monk to Breda, to procure the sanction of Charles II. to the proposed settlement of the ecclesiastical affairs of Scotland. He returned to London, May 26, and appears to have continued there till about the middle of August, being all the time in close communication with the principal leading persons and parties of the day, maintaining, at the same time, an active correspondence with the Presbyterian clergy of Scotland, who placed their entire confidence in him. A full abstract of his letters on the occasion, which are preserved in the library of the university of Glasgow, will be found in Wodrow’s History. When he returned to Scotland, he delivered to Mr. Robert Douglas a letter from the king, to be communicated to the presbytery of Edinburgh, in which his majesty declared his resolution to protect and preserve the government of the Church of Scotland, as “settled by law;” a phrase which completely blinded the clergy to the designs of Charles, and their representative, Sharp, who appears by this time to have been gained over, for the introduction of prelacy. On the subversion by parliament of the Presbyterian Church in August 1661, the royal pledge was thus at once transferred to the support of that episcopacy which had been overthrown in 1638, and which the people of Scotland could never be prevailed upon to recognize as the national religion. During his absence in England, Sharp had been elected professor of divinity in St. Mary’s college, St. Andrews. He was also appointed his majesty’s chaplain for Scotland, with a salary of £200 per annum. Having, on the rising of parliament, again gone up to London, he was nominated archbishop of St. Andrews, and he and three others were consecrated with great pomp at Westminster, December 15, 1671. On his return from London in April, he and his coadjutors, Fairfoul, bishop of Glasgow, and Hamilton, bishop of Galloway, entered Edinburgh in great state, and soon after Sharp went over to Fife, and having dined at Abbotshall with Sir Andrew Ramsay, on the 15th of that month, he proceeded to Lesley House. The earl of Rothes had prepared a sort of triumphal progress for him, by writing to several persons and corporations to meet him at different points of the route, so that the cavalcade swelled to seven or eight hundred horsemen. Among the company were the earls of Rothes, Leven, and Kellie; Lord Newark; Sir William Scott of Ardross, John Lundie of Lundie, Dr. Alexander Martin of Strathendrie, Arthur Forbes of Rires, Thomas Alexander of Scaddoway, and Sir John Gibson of Durie. Only two ministers, however, were present. In May 1662 Sharp and Fairfoul, with Leighton, bishop of Dunblane, proceeded to consecrate the ten other bishops of Scotland, the parliament having postponed its meeting till the bishops should be ready to take their seats. The unrelenting persecution of the faithful adherents of the Covenant which followed Sharp’s elevation to the primacy, increased the general odium in which his character was held, from the belief, which was common among them, that he had betrayed the cause of the church. On Saturday, July 9, 1668, he narrowly escaped assassination, by being shot at with a pistol, as he was entering his carriage in the High Street of Edinburgh, by Mr. James Mitchell, who was not apprehended till five years afterwards, and who was executed, in 1678, in violation of a solemn promise to the contrary. In changing sides, and turning from Presbyterianism to Episcopacy, Sharp acted only as Leighton did, but the difference between the two men was that Leighton was conscientious and sincere, and wholly devoted to his Episcopal and ministerial duties, while Sharp was more a political than a religious adherent of his party, and took the lead in the persecution of the Covenanters; and hence the very different estimate which history has made of these prelates. By his wife, Helen Moncrieff, daughter of the laird of Randerston, Archbishop Sharp had a son, Sir William Sharp, and three daughters, the eldest of whom was married to Erskine of Cambo, the 2d to Cunningham of Barns, and the youngest, Margaret, to William, eleventh Lord Saltoun. A magnificent marble monument was erected by his son over the place where his remains were interred in the parish church of St. Andrews. SHARPE, CHARLES KIRKPATRICK, an accomplished amateur in literature, art, and music, was born about 1781. He sprung from a house which, in more than one generation, had been distinguished by a taste for literature. In 1690 his ancestor, John Sharpe, Esq., purchased from the earl of Southesk, the estate and castle of Hoddam, Dumfries-shire, which has ever since continued in the family. His grand-uncle, Matthew Sharpe of Hoddam, fought at Preston on the side of Prince Charles, and died in 1769, at the age of 76. He corresponded with David Hume, the historian, who addressed to him one of his most characteristic letters. His father, Mr. Charles Sharpe of Hoddam, was a grandson of Sir Thomas Kirkpatrick of Closeburn, the second baronet of his line. Burns, in 1790 or 1791, wrote to him a humorous letter under a fictitious signature, enclosing three stanzas, written by him to what he calls “a charming Scots air” of Mr. Sharpe’s composition. In this letter he says, “You, I am told, play an exquisite violin, and have a standard taste in the belles letters.” The subject of this notice was his second son, the eldest son being General Matthew Sharpe of Hoddam, M.P. for the Dumfries burghs from 1832 to 1841. His mother was a daughter of Renton of Lamberton, a lady whose charms have been commemorated by Smollett in Humphrey Clinker. His brother was a Whig of extremely liberal politics, but his himself was a Tory of the old high cavalier school. He was educated at Christ church, Oxford, and at one period was designed for the ministry in the Church of England, but never took orders. Before he had attained his thirtieth year he had fixed his residence in Edinburgh, devoting his time principally to the cultivation of literature, music, and the fine arts. His first appearance in print was in the ‘Border Minstrelsy,’ edited by Sir Walter Scott, to which publication he contributed, in 1803, ‘The Tower of Repentance,’ a ballad of some merit. In 1807 he published at Oxford a volume of ‘Metrical Legends and other Poems,’ 8vo. He showed, however, higher skill as an artist than genius as a poet. At Abbotsford is his original drawing of Queen Elizabeth ‘dancing high and disposedly” before the Scottish envoy, Sir James Melville, who had excited her jealousy by commendations of the exquisite grace with which Mary Stuart led the dance at Holyrood or Linlithgow. On receiving it from Mr. Sharpe, then at Oxford, Sir Walter Scott, in a letter dated 30th December 1808, earnestly endeavoured to enlist him as a contributor to two works which he was at that time busy in projecting, viz., the ‘Quarterly Review,’ and the ‘Edinburgh Annual Register.’ Mr. Sharpe’s drawing of the ‘Marriage of Muckle Mou’d Meg, illustrative of a well-known incident in border history, like his ‘Queen Elizabeth dancing,’ is a fine specimen of the humorous. Etchings of them were made, as well as of the ‘Feast of Spurs,’ and many other things of the same kind from his ever ready pencil. In 1817 Mr. Sharpe edited the ‘Secret and True History of the Church of Scotland, from the Restoration to the year 1678, by the Rev. James Kirkton, with an account of the murder of Archbishop Sharpe, by James Russell, an actor therein,’ Edinburgh, 4to. To this work he appended a series of Notes remarkable for their piquancy. In 1820 he published an edition of the Rev. Robert Law’s ‘Memorialls, or the considerable things that fell out within this island of Great Britain from 1638 to 1684,’ Edinburgh, 4to. This work, it is said in Watt’s ‘Bibliotheca Britannica,’ forms a collection of perhaps the best selected tales of witchcraft and wizardry which has been yet published. IN 1823 he produced his ‘Ballad Book,’ a small collection of Scottish ballads, inscribed to the editor of the Border Minstrelsy. In 1827 he edited ‘The Life of Lady Margaret Cunninghame,’ and a narrative of the ‘Conversion of Lady Warristoun,’ IN 1828 he edited for the Bannatyne Club the ‘Letters of Lady Margaret Kennedy,’ or Burnet, to John, duke of Lauderdale, and in 1829, for the same Club, the ‘Letters of Archibald, Earl of Argyle,’ to the same nobleman. He also furnished the curious engravings illustrative of Sir Richard Maitland’s ‘History of the House of Seton to the year 1559, with the continuation by Alexander Viscount Kingston to 1687,’ printed for the Maitland Club in 1829. A small collection of his characteristic etchings appeared in 1833, under the title of ‘Portraits by an Amateur.’ In 1837 he edited ‘Minuets and Songs by Thomas sixth Earl of Kelly,’ and ‘Sargundo, or the Valiant Christian,’ – a Romanist song of triumph for the victory of the Popish earls of Glenlivat in 1594. Of these works the impressions were limited, and they are not much known, except to antiquaries and bibliographers. When Sir Walter Scott began to keep a diary in November 1825, about the first portrait he inscribed in it, was that of the subject of this notice. “Charles Kirkpatrick Sharpe,” it begins, “is another very remarkable man. He was bred a clergyman, but never took orders. He has infinite wit, and a great turn for antiquarian lore, as the publications of Kirkton, &c., bear witness. His drawings are the most fanciful and droll imaginable – a mixture between Hogarth and some of those foreign masters who painted temptations of St. Anthony, and such grotesque subjects. As a poet he has not a very strong touch. Strange that his finger-ends can describe so well what he cannot being out clearly and firmly in words! If he were to make drawing a resource it might raise him a large income. But though a lover of antiquities, and, therefore, of expensive trifles, Charles Kirkpatrick Sharpe is too aristocratic to use his art to assist his purse. He is a very complete genealogist, and has made many detections in Douglas and other books on pedigree, which our nobles would do well to suppress if they had an opportunity. Strange that a man should be so curious after scandal of centuries old! Not but that Charles loves it fresh and fresh also; for being very much a fashionable man, he is always master of the reigning report, and he tells the anecdote with such gusto that there is no helping sympathizing with him – a peculiarity of voice adding not a little to the general effect. My idea is that Charles Kirkpatrick Sharpe, with his oddities, tastes, satire, and high aristocratic feelings, resembles Horace Walpole – perhaps in his person also in a general way.” One of the great publishing houses of London offered him a large sum for his autobiography, but he refused the offer. Mr. Sharpe died 18th March 1851, aged upwards of 70. His collection of antiquities was among the richest which any private gentleman had ever accumulated in Scotland.